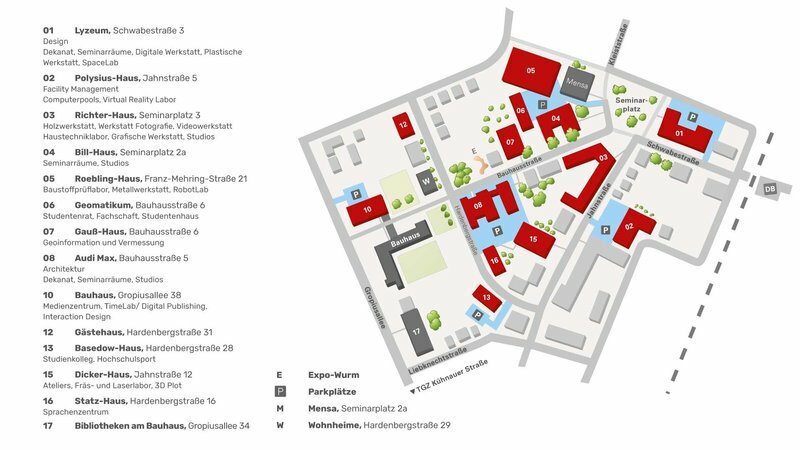 The campus is Dessau is home to the Department of Architecture, Facility Management and Geoinformation and the Department of Design. The direct proximity to the world heritage site “Bauhaus,” which until today is known as the cradle of modern design and architectural teaching is not only a creative and inspiring environment. It also provides motivation to orient education on high-quality handiwork, current practical application, and the most modern technology and experimental innovation. The degree programs of the same name offered by the Department of Architecture, Facility Management and Geoinformation in Dessau focus on the processes of planning, building, and using buildings. “Integrated Design” at the Department of Design is set up as an interdisciplinary program. In the “Dessau Model,” product design, communication design, and digital design are integrated in a general design program. The relaxed atmosphere, inspiring exchanges with professors, and short distances - just a few of the benefits of the campus in Dessau. The international students and cooperation partnerships with global players from business and universities around the world ensure there is an international feeling on campus. A relatively small campus in a small city does not have to mean a narrow mindset, as is demonstrated with many projects, films, exhibitions, conferences, and colloquia. Short distances for transferring knowledge, inspiration, and enjoyment of thinking. The Café am Campus team offers guests varied lunches and homemade cakes in a relaxed atmosphere. During the teaching period, there is an event in the Café every Wednesday evening. Excellently equipped workshops for creative design including computer-aided 3D modelling, computer pools, and modern studio and seminar buildings offer optimal conditions for studying.